Katherine Paterson, acclaimed author and National Ambassador for Young People’s Literature, has infused her version of St. Francis’s hymn of praise with the same joyous reverence as the original “Canticle of the Creatures,” written in 1224. The combination of her polished poetic text and Ms. Dalton’s glorious illustrations reach a sublime height. Bold, giant sunflowers towering over a small squirrel and rabbit greet readers as they enter a series of playful, meticulously framed medieval scenes spanning the seasons and the phases of life. We see peasants plowing, planting, and harvesting, as well as children running, playing with dolls, and embracing each other. Humans mingle harmoniously with farm and woodland animals in the double-spread illustrations framed by elements of nature: peachy lilies, ripe persimmons, oak leaves studded with plump acorns. Ms. Dalton, in her first children’s book, displays remarkable talent in her scherenschnitte (“scissor cuts”), a technique practiced in 16th century Germany and Switzerland and brought to Pennsylvania by German settlers in the 18th century. She has cut each illustration from a single piece of paper, painted it with watercolors, and set it all upon a black background. The result is that both illustrations and text have beautifully crafted spaces to shine. “We praise you for our Brother Sun,/ who in his radiant dawning/ every day reminds us that it was/ you who brought forth light.” Ms. Paterson’s words are bordered by sheaves of golden wheat and topped by a rich Old World scene of children holding hands, of reapers in the fields, and of hives, hungry bees, and fluttering butterflies. The only distracting aspect of Ms. Dalton’s illustrations depicting images of plants and animals that inhabit the central Italian countryside, is that the children, with their kerchiefs and their straw or ash-brown hair, look Germanic rather than Italian. This is especially ironic since Francis felt so attached to his homeland and his people that he chose to write in his local Umbrian dialect rather than in the Latin spoken in the church. Despite this incongruity, one would hate to imagine this picture book without these illustrations. The symmetry, the intricate details, the intelligent selection of activities, and the obvious reverence for the natural world all beautifully evoke the spirit of author Paterson’s reimagined poem based on St. Francis’s hymn. Katherine Paterson shows she is up to the daunting task of transforming the text of a saint beloved for his gentle, peaceable spirit. The daughter of missionaries, she spent four years in Japan as a missionary, studied the Bible in graduate school, and married a Presbyterian minister. In addition to her thought-provoking young-adult and middle-grades novels such as Bridge to Terabithia, she has explored Christian faith in her nonfiction books. 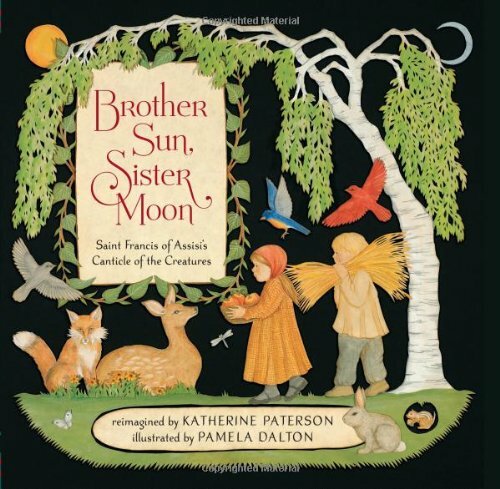 The stellar accomplishment of Brother Sun, Sister Moon is that people of all faiths—or of none at all—can appreciate the life-affirming spirit of her poem: “For all your gifts – for this wondrous universe in which we live, for family, for friends, for work and play,/ for this life and the life to come — / we sing our praise to you,” she writes, buoyed by images of children jumping rope and sharing fresh bread. In author Paterson’s prayer to “the Father and Mother of all creation,” she offers readers a simple, beautiful gift worthy of its roots.